A couple stuck in their car on the dual carriageway after a sudden dump of snow fear they face a cold night in their vehicle. Jak Roome was travelling to Wadebridge, Cornwall, to celebrate his 29th birthday with his partner, Jack Slymm, 27, when the roads ahead ground to a halt. Jak said that 3ft of snow fell quickly and the road beneath froze, making it impossible to tackle the hill in front. 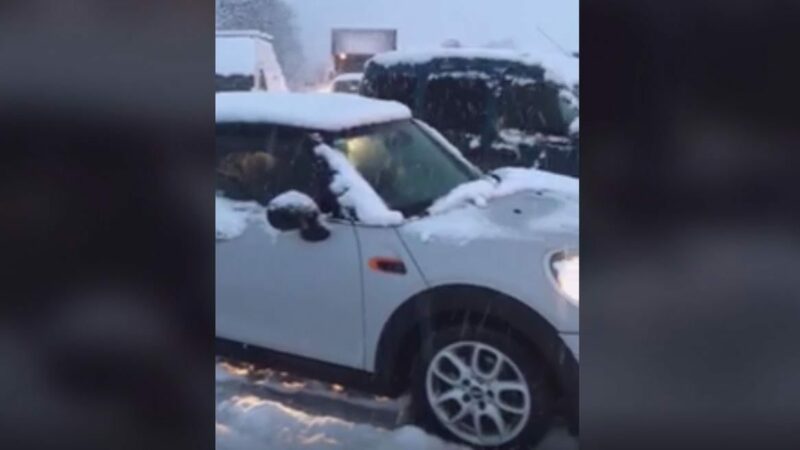 He said that many cars had attempted to brave the conditions but kept sliding back, and official advice online urged drivers on the road to stay in their cars. Jak, a hair stylist from Bristol, said: “We’re currently about five miles north of Camelford and about 10 miles south of Bude on A39. “We haven’t moved for over three hours, the snow just came down really hard and really quick and the ground froze underneath it. “The snow at the side of the road is about 3ft deep and anyone trying to get anywhere is just sliding. Jak said that he had recently taken his car to the garage, and luckily was completing the drive in a brand new grey Mini Cooper. He continued: “We’re going to be here all night I think, luckily we’ve got 3/4 tank but the people next to us only have half a tank left. To make matters worse, Jak and Jack have recently bought a puppy and are travelling with the young animal – and have to keep braving the conditions to get it water. “We’ve got a 13-week old puppy with us and we’re worried about her”, Jak said. “We didn’t have any water in the car so we had to melt some snow. “Luckily we had some food with us, but we can’t leave her outside for too long as it’s too cold. “No one has told us anything, but the traffic report says to stay with your car and wait for the weather to clear.